Complete Streets are roadways that are designed for all road users – pedestrians, bicyclists, motorists, and transit riders – of all ages and abilities. Complete Streets are safer, more accommodating, and more welcoming than roadways that are designed solely for automobiles. Incomplete street with disconnected sidewalk network in Riverside, NJ. 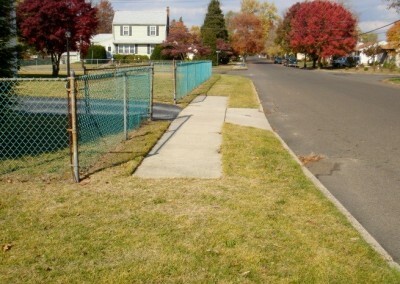 Worn footpath in Voorhees, NJ shows need for sidewalk improvements. Municipalities that implement Complete Streets enhance the livability and walkability of their communities, which promotes economic development and may even increase property values. 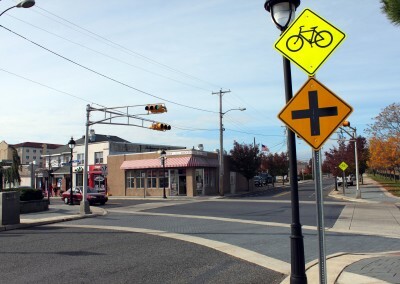 Communities that adopt a Complete Streets policy are also awarded one point on NJDOT Local Aid grant applications for infrastructure projects and 20 points towards Sustainable Jersey certification. Pedestrians can easily and safely access nearby shops, restaurants, and parks when streets include facilities such as sidewalks and marked crosswalks. 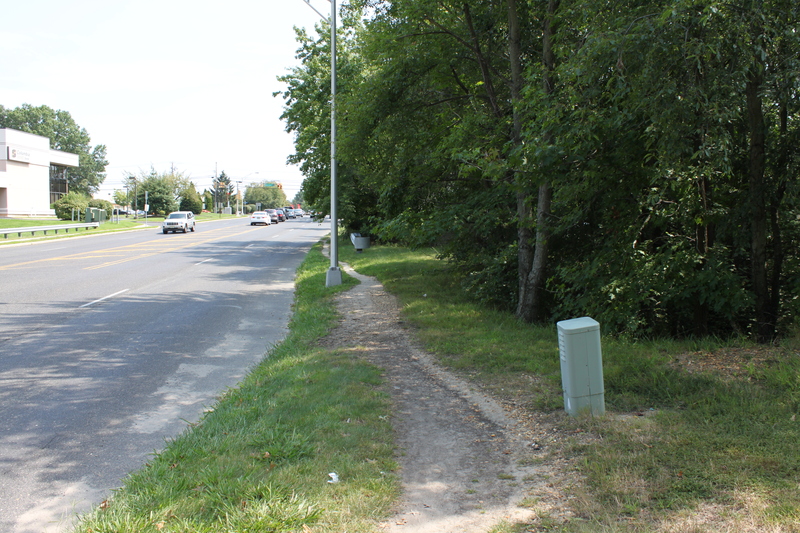 Without these accommodations, pedestrians may be hesitant or unable to reach a destination by foot, often leaving them with no option other than driving. Bicyclists are able to safely ride with traffic when accommodations such as bicycle lanes, bicycle route signs, or sharrows are provided on a street. These elements reinforce the right of bicyclists to travel on roadways and remind motorists to be aware of their presence. Providing designated space for bicyclists on a roadway greatly enhances safety by reducing conflicts with passing vehicles. Transit riders can easily access transit stops when sidewalks are incorporated into the design of a street. Installing pedestrian-scale lighting and benches also gives riders a comfortable, secure place to wait for the next bus. Children can safely play in their neighborhoods when roadways are designed to calm traffic rather than move it as fast as possible. Physical activity is necessary for children to stay healthy, yet incomplete streets often inhibit children from riding their bike or walking to school. Designing residential streets for slow vehicle speeds and providing sidewalks and crosswalks enables children to be physically active without compromising their safety. Senior citizens who may no longer drive can maintain independence and stay active in their community when they can walk to nearby destinations. 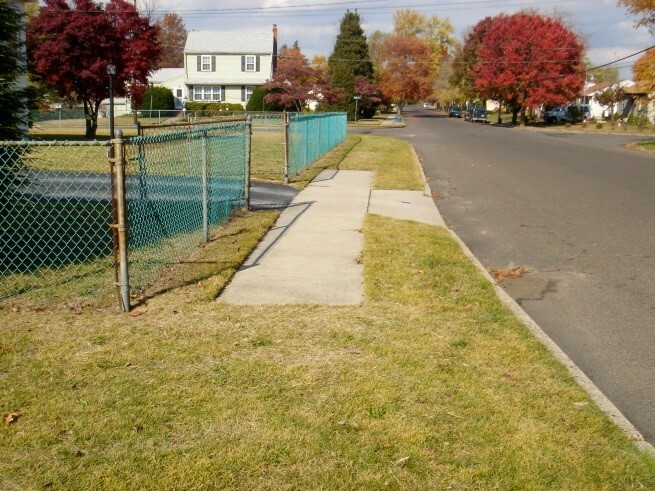 Providing continuous sidewalks, safe crosswalks, and ADA compliant-curb ramps are necessary to help seniors “age in place” and stay physically healthy. People with disabilities can travel safely and independently when roadways are designed for all users. Individuals may be unable to drive because of a disability, yet they could run errands or access local amenities if pedestrian accommodations are available. Having access to a network of continuous sidewalks with ADA-compliant curb ramps is essential for people with disabilities, especially those who are blind or confined to a wheel chair. Motorists also benefit from the enhanced safety of complete streets. As vehicle speeds are reduced in traffic calmed areas, accidents are less severe, especially those with pedestrians or cyclists. Additionally, the behavior of pedestrians and bicyclists is more predictable when they are accommodated, which should relieve motorists’ worries about passing cyclists or suddenly stopping for unexpected pedestrians crossing the road. All motorists are also pedestrians at some point and may even take advantage of new opportunities to walk and bike. 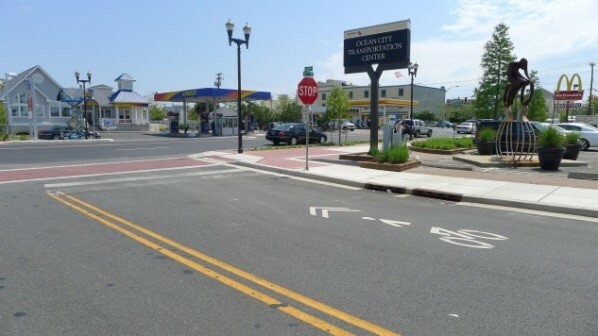 A complete street in downtown Pleasantville, NJ provides both bicycle and pedestrian infrastructure. All road users are accommodated on West Wood Street in Vineland, NJ. Adopting a Complete Streets policy directs engineers, transportation planners, and other decision makers to routinely consider and balance the needs everyone in all transportation projects. The intent of such a policy is not to immediately rebuild or retrofit the entire street network but rather to incorporate Complete Streets design elements into construction, reconstruction, and repaving projects when feasible. 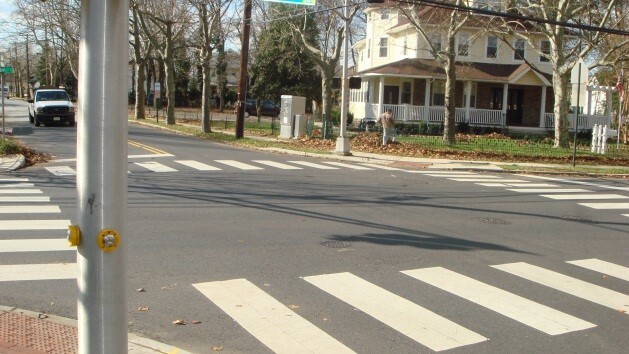 Instituting NJDOT’s Complete Streets project review checklist is another way to start conducting a routine Complete Streets evaluation during all roadway projects. 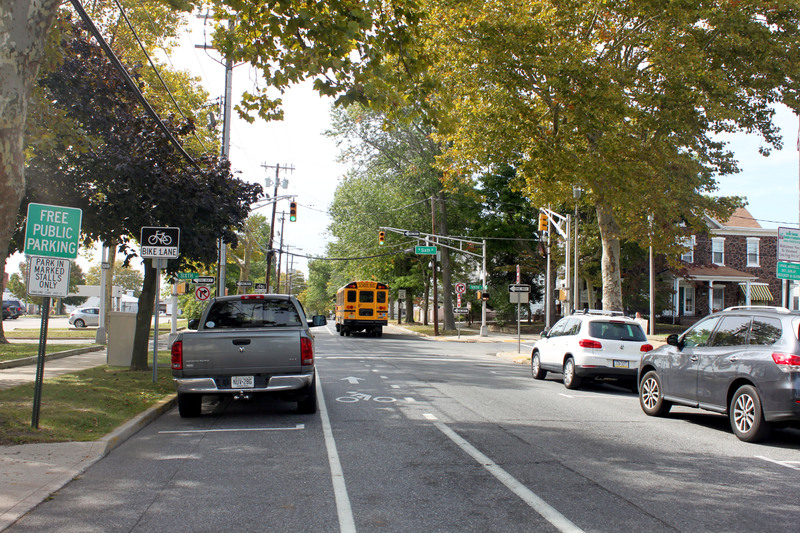 New Jersey is at the forefront of the national Complete Streets movement. Adopting a Complete Streets policy would place your municipality among a growing number of forward thinking communities committed to developing a safer, more inclusive and comprehensive network of roadways. In 2010, the U.S. Department of Transportation issued a policy statement urging state and local governments to adopt policies to incorporate safe and convenient walking and bicycling accommodations into transportation projects. 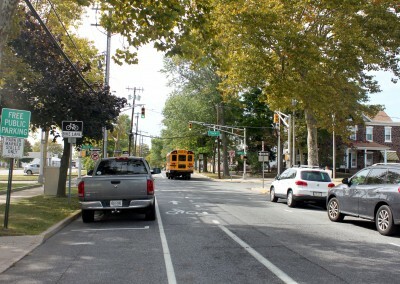 The New Jersey Department of Transportation was among the first state DOTs to adopt an internal Complete Streets policy and has won numerous awards recognizing the quality of its model policy. 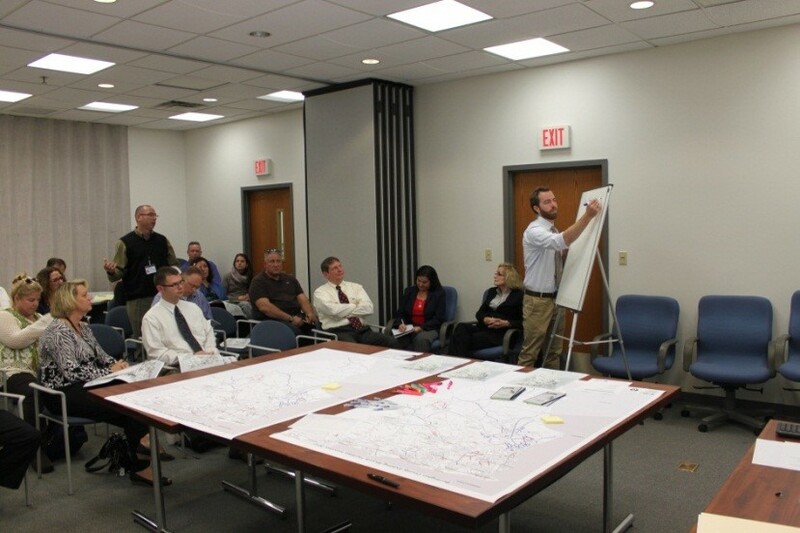 Communities throughout New Jersey have been following the example set by NJDOT. 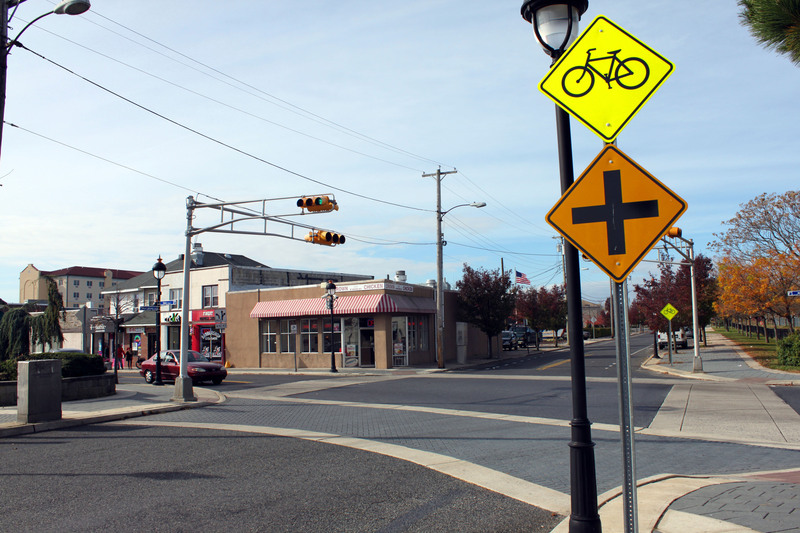 As of December 2014, 111 municipalities and 7 counties in New Jersey have adopted a Complete Streets policy. 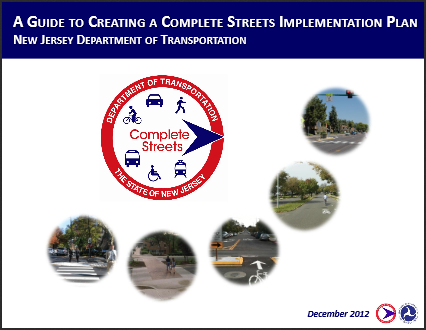 For a full list of communities in New Jersey with Complete Streets policies, please visit the Complete Streets Policy Compilation, hosted by the New Jersey Bicycle and Pedestrian Resource Center. 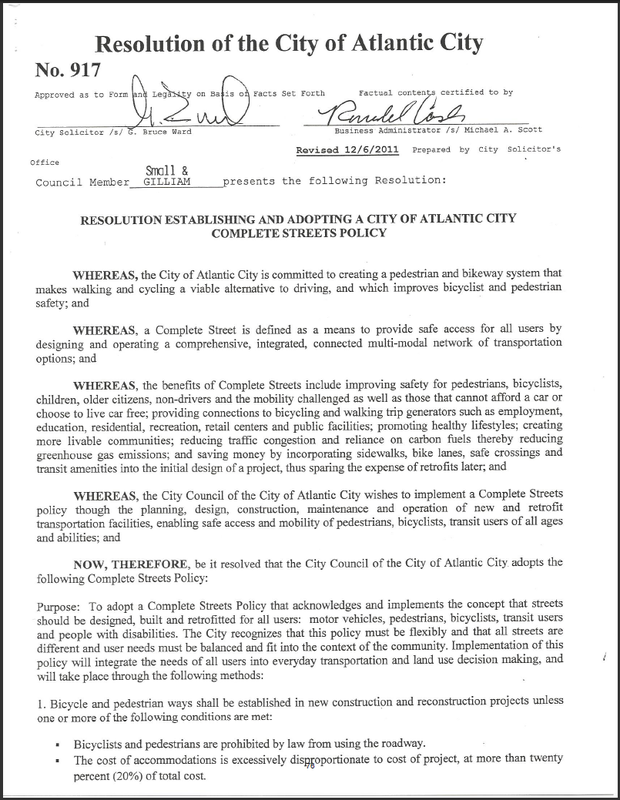 The following municipalities and counties in southern New Jersey have adopted a Complete Streets policy. Click the links below to view their policies. A common concern about implementing Complete Streets is the additional costs required to accommodate all modes of travel. The price of routinely accommodating all road users, however, is comparatively small on a project by project basis. Incorporating elements of Complete Streets during roadway construction projects or routine maintenance is also cheaper than retrofitting a facility later. For example, striping bicycle lanes while resurfacing a street would add little additional cost to a project, whereas returning to the same roadway afterwards solely to create a bikeway would be more expensive. It makes financial sense to routinely consider the needs of pedestrians, bicyclists, and transit riders during the process of designing and constructing roadways, rather than separately. Adopting a Complete Streets policy does not force a municipality or county to provide bicycle and pedestrian infrastructure when it is financially impractical either. A key element of most Complete Streets policies is to specify exemptions for circumstances when the cost of providing bicycle and pedestrian accommodations is excessively disproportionate to the cost of the entire project. Many communities set a threshold for how much they are willing to spend to accommodate modes other than the automobile (i.e. 20% of total project costs). Implementing Complete Streets supports economic development and tourism and adds value to a community, as safe, pedestrian and bicycle-friendly communities are desirable places to live and work. Communities that adopt a Complete Streets policy also have a competitive edge on Local Aid grant applications, providing them the opportunity to attract even more funding assistance. Building Complete Streets provides long-term financial and environmental benefits, which far outweigh the relatively small upfront costs. The above information is not intended to be legal advice, nor does it constitute legal advice and should not be used as a substitute for qualified legal advice from an attorney licensed to practice law in the state of New Jersey. No responsibility is accepted for any loss, damage or injury, financial or otherwise, suffered by any person or organization acting or relying on this information or anything omitted from it.